You can’t beat an LED wall for a high-impact display for any big event. For image quality and versatility LED is really the only choice. If you’ve used projection systems in the past, you are going to be surprised by how cost-effective and easy-to-use an LED wall is. Luminosity: This one is really simple. The brightness of an LED wall simply can not be achieved with even the best projection system. Usability: Point a projector at a flat screen and you’re done. You’re really done. That’s it. No more options. Customizable and modular LED walls let you configure your wall in just about any way you can imagine. Use an LED wall to make any space your own, use it in a way no one has before. Because they are lightweight, installation and teardown are a breeze. Contrast: An LED wall is clearly the winner in any situation where ambient light is an issue. Anything projected on a screen is going to be washed out in anything but a very dark room. Projectors aren’t even an option for outdoor daytime events. LED walls work flawlessly. Shadow casting: Avoiding casting a shadow when anything passes between your projector and your screen can be impossible in some situations. Not a problem with an LED wall. HD: Do we even need to say it? Do you even want to talk about standard definition projection for your event? We didn’t think so. A projector simply doesn’t have the efficiency, contrast or brightness to deliver HD images and videos. Whatever type of event you are planning, you should be considering an LED wall as a focus for your overall event design. Want to make a splash with your big product launch? Light up an entire stadium with a video wall. Project product videos, entertainment, and attention-grabbing lighting effects well into the back row. Throwing the party of the decade? Use an LED Video Wall as a DJ backdrop. Splash your beat-synched images, videos and pulsing lights across the entire wall. You’ll keep the crowd going all night, and your party will set the bar pretty high for whoever throws the next big bash. 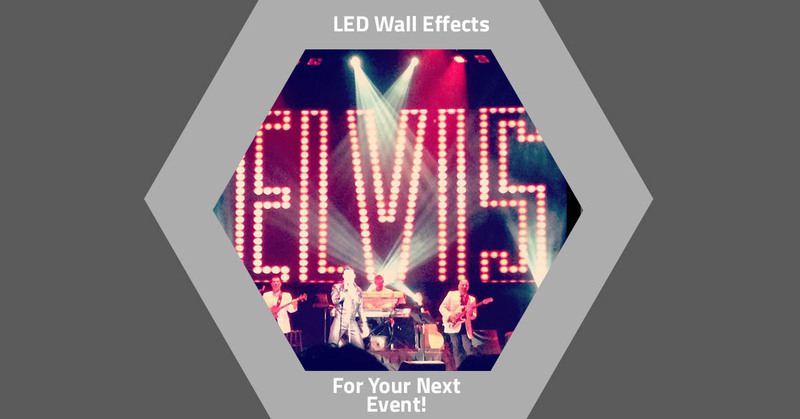 LED walls are also a great, but often overlooked, option for weddings, theatre productions, community concerts, and indoor and outdoor fundraising or political events. Choose an LED wall system that’s a perfect fit. LED systems are more flexible and provide more options than you may think. The Oracle Black Widow HD-9 system clearly sets the standard with crazy fast refresh rates, extreme flexibility and water resistance. We challenge you to come up with a lighting effect that we can’t execute with the Black Widow. For quick set-up and elegance, you can’t beat EFX-20 panels. They click together in virtually seconds. So if you’re touring, producing a television segment, or managing anything where time is a critical factor, you can’t go wrong. Super-flexible EFX-37 LED Panels are wonderful for producing unique and flowing formations. The panels bend and twist so you can design the lighting display of your dreams with virtually no limitations. Give us a call at Rythm EFX. We’ve been at this for a long time. You name it, we’ve done it. We love this stuff and that’ll shine through when you work with us for your next event.